On March 11, Hip Hop trio Epik High released their first independent EP. Sleepless in __________, which runs just slightly over 20 minutes, boasts exactly what Epik High is known for: their unique and distinctive style of Hip Hop used to aptly describe the confusing amalgam of human emotions and feelings. Drawing inspiration from loneliness, heartbreak, and sleeplessness, Sleepless in __________ features comforting, melancholic beats throughout its six tracks. This allows you to passively tune into the songs, letting it play in the background, becoming a “driving playlist, study playlist, and […] bedside playlist“, but don’t let it be. Not for the first round of playing, at least. That’s because the EP features meaningful lyrics, soft but sophisticated beats, and careful, conscientious arrangements of vocals and raps — an easy-to-listen EP which was probably just as difficult to make. Take “Eternal Sunshine” for example, which exhibits a juxtaposition of its wistful and pensive lyrics against its positive and cheerful beats. Composed by BTS‘ Suga and El Capitxn, the track features a compelling mix of Hip Hop and Jazz. Despite its funky, bright beats, record-scratching, and hip guitar details, “Eternal Sunshine” centers around the idea of anxiety and depression haunting youth who are just trying to survive. Tablo‘s verse at the start, though, reminds its listeners that they’re not alone. Just as Sleepless in __________revolves around the idea of loneliness, and insomnia, it’s also influenced by the idea of love and heartbreak: another reason for sleeplessness. “No Different”, which was arranged by Code Kunst and features Malaysian R&B singer Yuna, is probably the most memorable track on the record. With the pairing of Tablo’s deep rap and Yuna’s smooth, layered vocals, there’s an irresistible quality to the song; it’s only made more emotional and gut-wrenching with the slow percussions in the instrumental, making the lyrics stand out more. Reflecting on a relationship that’s unraveling, “No Different” leaves you with a lingering sense of emptiness. Merely resetting my mind and body that only cared about you. I’m only transforming for the new season. being more careful after being hurt. I mix poison with poison. Hoping for an antidote, what’s new? It’s toxic but so is love. 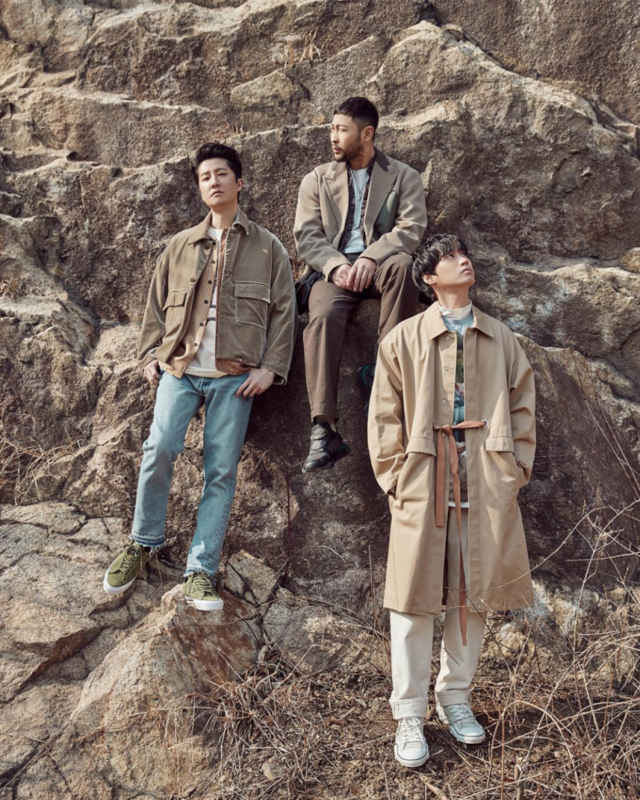 Epik High’s works often feature well-thought out collaborations that would make their tracks stand out in the best way possible, and it shows exceptionally in “Lovedrunk”. The contrast between Crush‘s balladic, light vocals, and Tablo’s and Mithra Jin‘s harder, self-berating rap is what hits the nail on the head. Epik High also took the concept of creativity, and gave it a spin we don’t talk about enough in “Rain Again Tomorrow”. With quick, steady percussions in the instrumental, the track considers the restlessness of a buzzing, creative brain, which leaves one feeling unwillingly awake and unrested. I know I’m walking on a dead-end road. But I repeat this cycle dozens of times. they give it a likeable name – ‘creation’. But perhaps the most beautiful selling point of this album is the seamless track transitions from start to finish. In its continuously smooth transitions, Sleepless in __________is the perfect description of sleeplessness itself: a metaphor for the lull, never-ending state of befuddled wakefulness. The subtle, excellently finessed transition from “Rain Again Tomorrow” to “Lullaby for a Cat” is satisfying to listen to. Almost undetectable, the two tracks provide the illusion of one long track, made possible by the slowing down of the last few bars of “Rain Again Tomorrow” and carrying them over to “Lullaby for a Cat”. 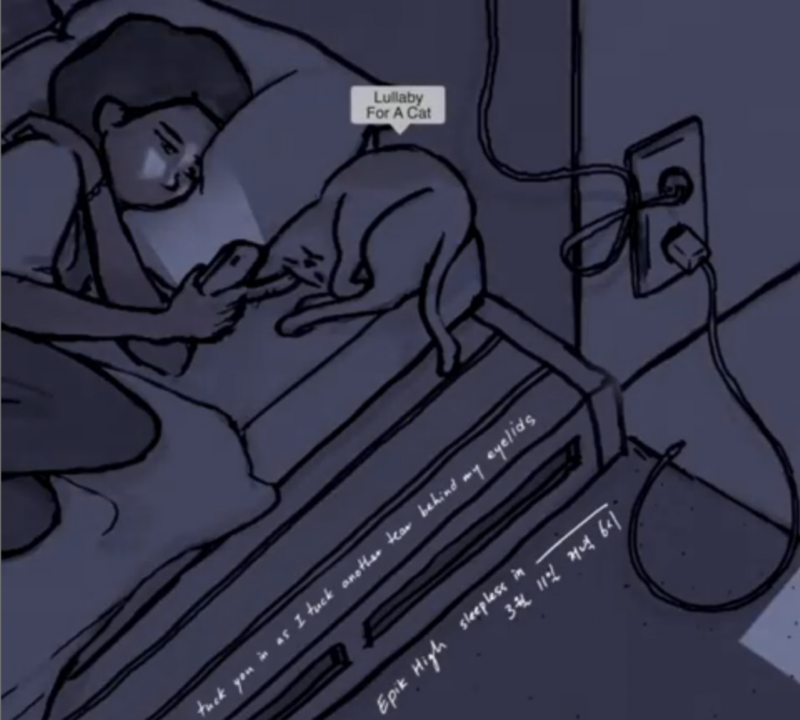 The gradual introduction of the piano, slow percussions, strings and Tablo’s muffled verse about the cycle of loneliness define “Lullaby for a Cat” and conclude the EP. That’s not where the experience ends though. “Lullaby for a Cat” leisurely loops back to “Sleepless”, which in turn smoothly progresses into “In Seoul”. These two introductory tracks are probably the best summary for Sleepless in __________. The use of a robotic voice emphasises the sentiment of being alone and awake; a machine and artificial companion for one on a long, lonely night. “Sleepless” is accompanied by a quick transition to “In Seoul”, which consists of nostalgic old-school Hip Hop beats, Sunwoo Jung-a‘s forlorn vocals along with slow-paced, comforting raps from Tablo and Mithra Jin. The simplicity of the song is balanced with the complexity of the lyrics. “In Seoul” echoes one’s journey as they navigate through life, and deal with inequality, the complexities of society, and various struggles. If you took the concepts of sleeplessness and insomnia, broke it down and tried to portray it in the form of music: this EP would be exactly it. 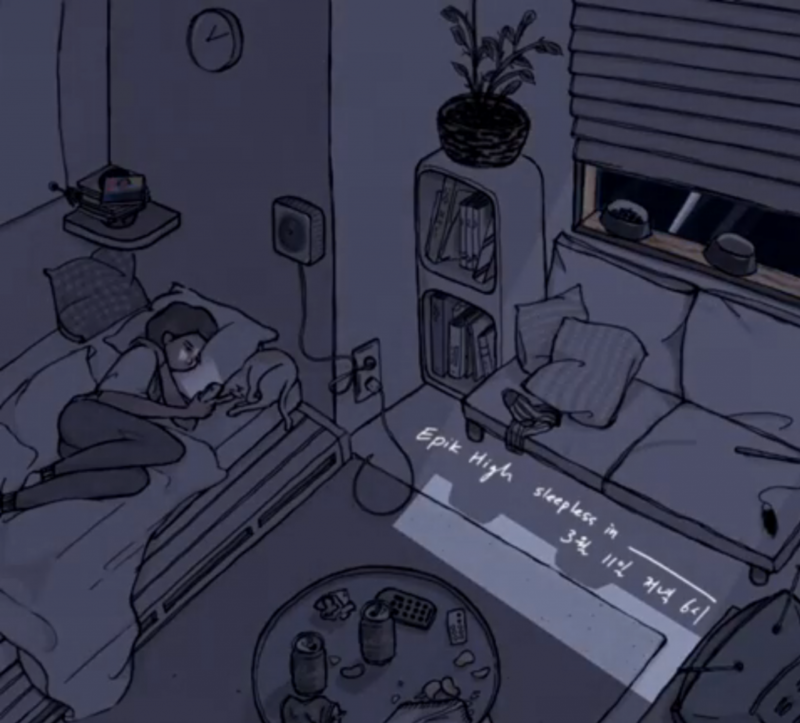 Sleepless in __________continues to build upon the Epik High’s evolving discography. The record comes from a personal place and it’s obvious in its vulnerability with the depth given to it through the instrumentals and lyrics. Epik High has done something wonderful yet again.